museum honors. Patrick Pearse was a nationalist and an educationalist. He played an important role in the 1916 Rising and was later executed for his role in 1916 Rising. The Pearse Museum was where Patrick Pearse lived and ran his innovative Irish-speaking school, Scoil Éanna, between 1910-1916. The Pearse Museum is built on the same area, where Scoil Eanna, an Irish-speaking school was run by Patrick Pearse. The building is known as the Hermitage. This museum is a must-visit place for fans of history and of the various uprisings and revolts that Irish history has seen. The museum is located about 8 km from Dublin City Centre. You can reach it by bus. Though guided tours are indeed available, they are only available on demand. Apart from these various seasonal events are also held at the place. The Museum is located on Grange Road, Rathfarnham. The museum was established in 1979, but the house that it is built in was itself constructed in the eighteenth century. The house is located in a scenic and beautiful parkland, which makes a visit to this museum very pleasant and alluring. The School that Pearse established was also set up in this house. However, after Pearse’s execution, the school starting losing its students and financial support, until 1935 when the school closed altogether. The museum has put a lot of effort to recreate some of the original rooms and maintain the aura that it must have held in the days of the school. The museum tells the story of the two brothers who were inspiring educationists more than anything else. The museum sits in the middle of about 50 acres of beautiful parkland. The exhibition includes many items from Pearse’s daily life. You will get the chance to stroll through rooms of this house, which, in their day, must have been Pearse, his family and his students lived and worked. If your interest in the 1916 rising is merrow deep, and if you are also inspired by the actions and the sacrifices of Patrick Pearse, then a visit to this museum will rejuvenate your admiration of this Irish hero and his efforts. The surrounding area is also marked by some eighteenth and nineteenth century follies, as well as a wild river valley and forested areas. There is simply too much beauty outside the museum and an air of tragedy inside it. The natural splendor of that parkland is also made use of. In the summer, various events and concerts are conducted in the outdoors. There is also a nature study room installed with the museum exhibits. It acts as a guide and a source of knowledge to study all the fauna and flora that you will be able to see in the parklands. The St. Enda’s park is part of the allure of the whole place and it is also responsible for a huge chunk of visitors that come to the museum every year. The museum operates between 9:30 and 17:30 during most of the year. What is even better is that the museum has FREE admission! A tour of the house will take you through various rooms of the house. The entrance hall is where the tour begins. 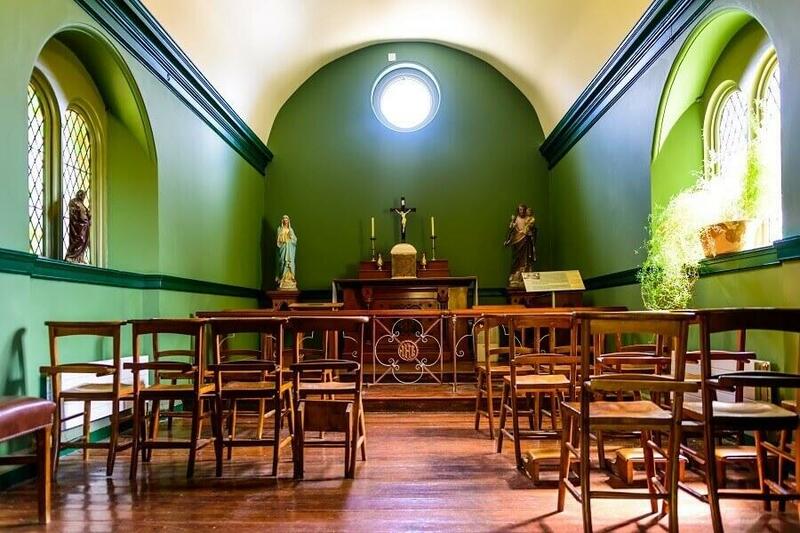 This room leads, to the right, to the study of Patrick Pearse, which is still set up with the same furniture and carpet which once graced the room, in the days of the school. To the left of the Entrance Hall, there is the William Pearse Gallery with images and photos from the significant moments of the man’s life. There is also access to the sitting room and from there, to the art gallery. This gallery was here in the days of the school, and it is still maintained in the same way as it was during the days of the school. This gallery is one of the most interesting places in the Pearse Museum. You can enter the Dormitory from this gallery. In the dormitory, the beds of the students are still laid out in the same way as they were when Patrick Pearse taught his pupils. The small school Museum includes some remnants from the school itself. This room is filled with memories of what it was like to be a student and to be a teacher and a nationalist in the house. The Halla Mor was the hall where lectures were conducted. This was also the place, where Pearse and his fellow nationalists would talk to the boys. This place used to be filled with benches and tables, but it is vacant nowadays, and finally, the last stop on the tour is the Chapel. Many students also contributed to the construction of this chapel. Its simplicity and minimalism are very reminiscent of the qualities that the school was based on. Apart from the hall, the only other classroom was the Scoil Eanna Classroom, which still houses the benches and the rostrum as well as the same board that were there during the days of Patrick Pearse. There is an air of revolution and unrest in the museum which is eerily juxtaposed by the liveliness and unconditional bliss that is seen and felt in the surrounding park-lands. Combine them both, and a visit to the Pearse Museum will prove to be a thought provoking event for you. You can reach Pearse Museum easily by car and public transport. Bus Route(s): No. 16 from City Centre. Get off at the stop opposite the Park on Grange Road. Watch the video and learn what to expect in Pearse Museum.